SAVABEEL (AUS) (Brown 2001-Stud 2005). 3 wins-1 at 2, MVRC WS Cox P., Gr.1. Champion NZ Sire 2014-15 & 2015-16. Sire of 608 rnrs, 403 wnrs, 57 SW, inc. Sangster (Victoria Derby, Gr.1), Lucia Valentina, Soriano, Savaria, Kawi, Scarlett Lady, Costume, Diademe, Pasadena Girl, Brambles, Hall of Fame, Sound Proposition, Coldplay, Floria, Lady Kipling, Saavoya, Savvy Nature, Chintz, My Emotion, Nurse Kitchen, Do Ra Mi, Tullamore, Pump Up the Volume, etc. KEKOVA, by Elusive City. 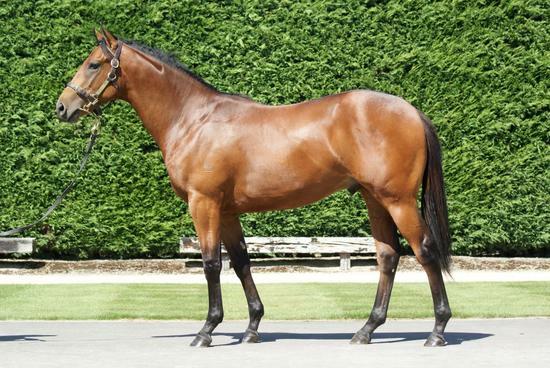 7 wins from 1200m to 1600m, NZ$142,178, CJC Great Easter S., L, Wairarapa Thoroughbred Breeders' S., L, CJC Christchurch Casino H., Manawatu RC McEntee Event Hire H., Waikato RC Anexa Animal Health H., 2d CJC Canterbury Breeders S., L, Hawkes Bay AON Insurance Brokers H., Elbow Sports Bar H., 4th CJC Easter Cup, Gr.3, Levin S., L. Half-sister to RAPID KAY. This is her second foal. Her first foal is a 2YO. KEKOVA (Elusive City). 7 wins. See above. Skittle. 5 wins at 1350m, 1400m, Hawkes Bay Jackson's Bakery & Cafe H., WRC Konami H.
Cool Rapids. Winner at 1100m, BRC Coca-Cola Amatil P., 2d BRC National Transport Insurance P., FIIG Securities P., 3d BRC Australian Special Metals P., SITA Environmental P.
Ekklestone. 3 wins to 1200m in 2015-16 in Aust. Clos de Tart. 2 wins at 1200m, 1400m in NZ. Speedy Franzalis. Winner at 1200m in 2015-16 in Aust. Locally Sauced. 2 wins at 2000m, 2100m in 2016-17 in NZ. Purrfect Paragon. 8 wins-4 at 2-from 1000m to 1600m, A$100,435, to 2016-17, Alice Springs TC Inglis Red Centre 2YO Classic. She's Trendy. Winner at 1100m in Aust. Maiden en Zed. Winner at 1400m in NZ. FAIROSS (Pharostan). 9 wins from 1400m to 2400m, NZ$123,030, ARC Mitchelson Cup, L, WRC Simply Food H., ARC Sleepyhead H., CJC Bells H., 2d CJC Steam Tug Lyttelton H., ARC Steinlager H., Avondale JC Mt Roskill Improvers' H., Wilkinson Insurance Brokers H., CJC Rangiora Liquor Merchants H., Joust/Tambour Ryegrass Blend H., BOP RC Carter's H., Tauranga Air NZ Travel Centre H., 3d CJC Fitzgerald Arms Tavern H., ARC Montana H., Dunstan Stayers Championship Qualifier, More FM H., TV Guide H., CJC The Bard on Avon H., WRC Winstone Aggregates H., Dargaville RC Northland Cup. Racing Waters (Racing is Fun). 3 wins. See above. Choppy Waters. 2 wins at 1200m, 1400m in NZ. BALLYBRIT (Wandering Eyes). Champion 2YO in NZ. 7 wins at 2, Great Northern Foal S., Gr.3, Avondale S., L, ARC Breeders' P.H., Ellerslie S.H., Waikato RC Junior H., WRC Nursery H., 2d ARC Welcome S., L. Sire. AVENGER (Wandering Eyes). Second top colt on The 1977-78 NZ 2YO Free H. 6 wins-2 at 2-from 1000m to 1600m, Avondale S., L, MVRC Morang H., VATC Belhaven H., Rotorua RC Coruba '6000' H., Waikato HC Masters H., 2d Manawatu Sires' Produce S., Gr.1, ARC Eclipse S., Gr.2, 4th ARC Ellerslie Sires' Produce S., Gr.1, Hawkes Bay Challenge S., Gr.3, ARC Welcome S., L. Sire. Shanghai Triumph. 2 wins at 1650m, 1800m, HKJC Gansu H.
Baird of Avon. 6 wins-1 at 2-at 1200m, 1400m, ARC Bledisloe H., Paeroa RC Spring H., ARC Ski South H., 2d ARC Bowen H., Broadway H., 21st Battalion H. Sire.